UL is a global independent safety science company with expertise in innovating safety solutions. We have employed exacting scientific processes and the highest ethical principles to deliver trusted results for more than a century. UL certifies, validates, tests, inspects, audits, advises and educates. Progress is an unstoppable, transformative force. New technologies, product advances and globalization are arriving one on top of another at a dizzying pace. Innovation makes us more efficient, more productive and more connected, but there is a cost, and that cost is risk. To help mitigate the emerging risks, UL is developing New Science. Through fundamental discovery, testing methodologies and equipment, procedures, software, and standards, UL is creating important ways to make the world safer. 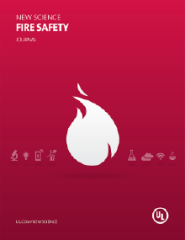 To find out more about how UL is advancing the New Science of Fire Safety, Sustainable Energy, Indoor Air Quality, and Transaction Security, go to www.ul.com/newscience.